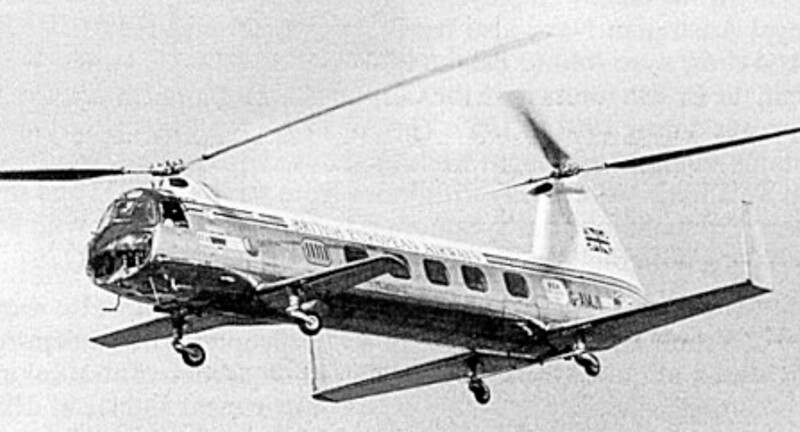 The Bristol 173 was the first helicopter specifically designed for commercial operation and passenger transport in particular. Two Mk.1 prototypes were begun in 1948 to Ministry of Supply Specification E.4/47. Ground tests started in 1951. It had two three-blade counter-rotating rotors, but it could fly on one Alvis Leonides 73 engine and the centre of gravity could be displaced. The two rotors were synchronized by a shaft in conjunction with a gearbox. In the event of a breakdown the shaft could transmit power from the working engine. The rear rotor was carried on a pylon which was part of the vertical fin structure. Two tailplanes were set at a sharp angle to improve longitudinal and lateral stability. The 173 had virtually the 171 Sycamore Mk. 3’s transmission system, rotor assemblies and engine installation, except that one engine rotates in the opposite direction to the other. Ground resonance originally caused some trouble. The problem was overcome by linking the right- and left-hand oleo-struts of the undercarriage by small-bore hydraulic piping. The latter formed the two arcs of a circle seen above the upper part of the legs. The first, G-ALBN, made its maiden flight on 3 January 1952, after some eight months of ground trials and tethered flights. 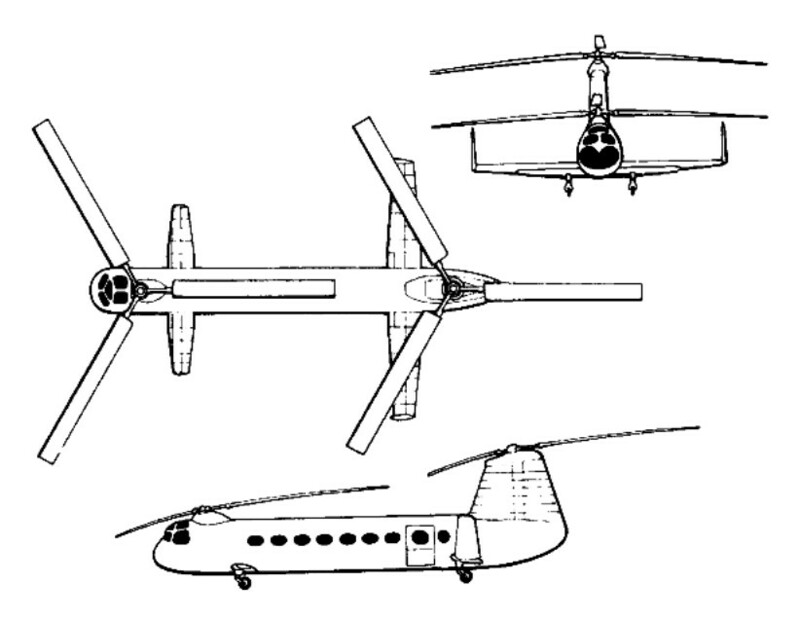 It was Britain's first tandem-rotor helicopter design, and in this early form was powered by two 575hp Alvis Leonides 73 piston engines and could carry ten passengers. In 1953 this machine was handed over to the Admiralty for Naval trials. Trials were carried out with this aircraft in 1953, from the aircraft carrier HMS Eagle. On 31 August 1953 a prototype 173 Mk.2 (G-AMJI) was flown, differing from the first machine in having two pairs of stub wings to off-load the rotors, the rear pair carrying upright fins at their extremities. These features were later removed, G-AMJI reverting to the Vee-tailed configuration of the Mk.1 and joining its stablemate for Naval trials as XH379. On 20 July 1956 it was delivered to BEA and returned to the civil register for handing trials in BEA colours. It was based at Gatwick for the period of the trials before being written off in a landing accident in 1956. The Mk.3, with more powerful engines, (two Alvis Leonides Majors rated at 850shp each) as well as metal instead of wooden four-bladed rotors, marked a greater advance. Seating was up from 14 in the Mk.1 and 2 to 16 in the Mk.3. three were ordered but the Mk.3 suffered from cooling problems and its service trials in 1956 were not entirely successful. In the event, only one (XE286) was flown, the other two being utilised for ground testing. In 1956 the Royal Navy decided to adopt the Bristol machine for the antisubmarine role, placing an order for sixty-eight aircraft. The production version, to be known as the Bristol 191, was to have folding rotor blades and a shorter fuselage, to enable it to use existing carrier deck-lifts, and the rear legs of the quadricycle undercarriage shortened to facilitate loading of an external torpedo. The Bristol 173 Mk.3 was offered to BEA. In July 1958 the Bristol 192 made its maiden flight and this marked the successful climax to the development of the 173. Fuselage length: 54 ft. 2 in.